The Maya calendar is a system of distinct calendars and almanacs. Dating back to at least the 6th century BCE the Maya calendar system essentials are based upon a system which had been in common use throughout the region. The Maya calendars, along with those of the Aztecs, are the best-documented and most completely understood. Maya mythological tradition credits the deity Itzamna with bringing the knowledge of the calendar system to the ancestral Maya. These ancient civilizations used these calendars as a way of marking time to predict changes that would affect their survival and destinies. These calendars were often linked with one or more gods, who at some point in their progression, would return. Today, as human consciousness evolves in the age of healing, awareness, technology and reasoning, our attention is riveted to one calendar in particular, the Mayan Long Calendar, as something within its end time date, resonates for many souls. The date is December 21, 2012. There is much discussion about what humankind should expect on Dec. 21, 2012, when the Maya's 'Long Count' calendar marks the end of a 5,126-year era. At the Winter Solstice of 2012 both the 26,000 year and the 5,200 year cycles are completed prior to the birth of the new cycles and a new world. The alignment of Earth, Sun and stars with the centre of the Galaxy (the Milky Way) at this time will allow a massive ray of Galactic Light to illuminate, purify and energize the Earth and its life forms. This will facilitate our quantum leap to the next dimensional reality. The Mayans indicated that the scale and nature of this leap is the first such occurrence in human evolution. The most important of these calendars is one with a period of 260 days. This 260-day calendar was prevalent across all Mesoamerican societies, and is the oldest of the calendars. It is still used in some regions of Oaxaca, and by the Maya communities of the Guatemalan highlands. The Maya version is commonly known as the Tzolkin, or Tzolk'in. 5. In most cases, the actual day name as spoken in the time of the Classic Period (ca. 200-900) when most inscriptions were made is not known. The versions given here (in Classic Maya, the main language of the inscriptions) are reconstructed based on phonological evidence, if available; a '?' symbol indicates the reconstruction is tentative. 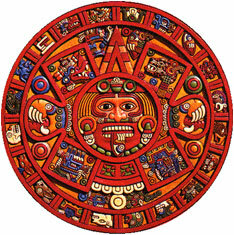 The Tzolk'in is the oldest of all the Mayan Calendars and is referred to as the Master Calendar. All the other Mayan calendars are synchronized to it. The calendar is composed of 20 day signs in combination with the numbers 1 to 13, creating a 260-day cycle (i.e., 20 X 13 = 260). Each successive named day was numbered from 1 up to 13 and then starting again at 1. There were 20 individual named days. The Haab Calendar is similar to our western calendar in that it has approximately 365 days. It consists of 18 months of 20 days each, with an extra, shortened, five-day month at the end. The Haab was the foundation of the agrarian calendar and the month names are associated with the cycle of the rains, agriculture, and harvesting. It is estimated that the Haab was first used around 550 BCE with the starting point of the December winter solstice. Each day in the Haab Calendar was identified by a day number within the month followed by the name of the month. Day numbers began with a glyph translated as the 'seating of' a named month, which is usually regarded as day 0 of that month, although a minority treat it as day 20 of the month preceding the named month. The Calendar Round is a combination of the Tzolkin Calendar and Haab Calendar. The dates are composed by interlacing the dates of a 260-day period in the Tzolk'in Calendar with dates from a 365-day period of the Haab calendar. One Calendar Round cycle thus includes 18980 distinct dates and lasts approximately 52 years (the least common multiple of 260 and 365 is 18980). It creates a cycle that is just under 52 years. The Long Count Calendar represents a cycle of time that is approximately 5,125 years, ending with the 13th cycle (Bahaou). Each cycle lasts about 394 years or 144,000 days. Currently, we are in the 12th Baktun, which will end on December 20, 2012 or the Mayan Calendar date of 13.0.0.0.0. The Long Count calendar was used to track longer periods of time, and for the inscription of calendar dates (i.e., identifying when one event occurred in relation to others). It is based upon the number of elapsed days since a mythological starting-point. This starting-point is equivalent to 11 August 3114 BCE in the proleptic Gregorian calendar or 6 September in the Julian calendar. Because the Long Count calendar is non-repeating, it was widely used on monuments. Rather than using a base-10 scheme, like Western numbering, the Long Count days were tallied in a base-20 scheme. Thus 0.0.0.1.5 is equal to 25, and 0.0.0.2.0 is equal to 40. The Long Count is not consistently base-20, however, since the second digit rolls over to zero when it reaches 18. Thus 0.0.1.0.0 does not represent 400 days, but rather only 360 days. By its linear nature, the Long Count was capable of being extended to refer to any date far into the future or past.